Now you can have a mermaid on your shirt because this is a swimming mermaid t-shirt. The t-shirt shows an oval that gives you a look under the sea and you can see a mermaid swimming. 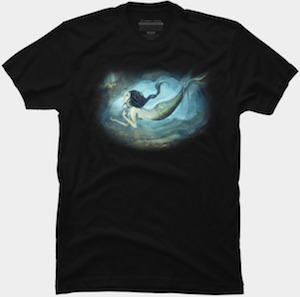 You can get this mermaid t-shirt in styles for men, women, and kids and it comes in many sizes and colors to make it all perfect for you. So look no further is you like a mermaid on your t-shirt because this shirt is just perfect for you. If you want people to believe you are a true mermaid then you just need to get this mermaid off duty crop top t-shirt. You can get this mermaid t-shirt in women’s sizes Small, Medium, and Large and it come sin a bunch of fun colors including grey, yellow, pink, and white. 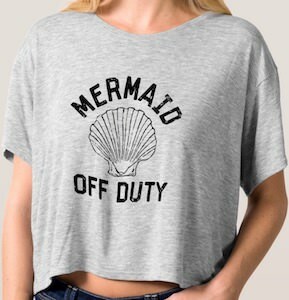 On the women’s crop top you can see a big seashell and around the shell it says “Mermaid Off Duty”. So now you don’t have to explain why you have legs as it is clear that mermaid have those when they are off duty. Now you just need some fun pants and wear this shirt and you are ready to be a true mermaid on land. 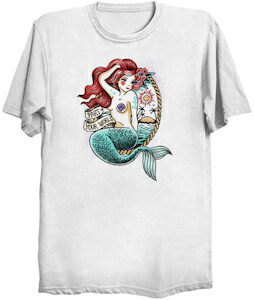 If you like mermaids and tattoos then you should check out this tattoo style mermaid t-shirt. The t-shirt is available in style for men and women and comes in sizes Small – 6XL and comes in some other colors too and they are made from 100% cotton. On the shirt, you can see the tattoo of a mermaid with a seascape in the background and even the mermaid has a tattoo. Behind the mermaid, it shows a banner that says “part of your world”. It’s a different style t-shirt and that makes it just perfect for you as it would look great on you. Now there is a perfect t-shirt for summer that shows the sea and a sunset and on the sea you can see a surfboard with a mermaid on it. Yes a surfing mermaid t-shirt is of course special. This t-shirt is available in many colors and the image on it is in black and white giving it a real cool contrast. 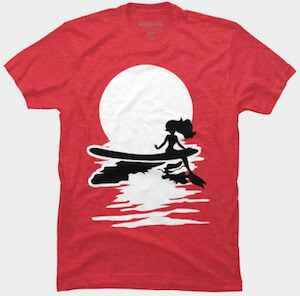 You can get this surfing t-shirt for men and women and it is available in many sizes and it is made from 100% cotton. Show the world how amazing summers can be with this mermaid t-shirt. 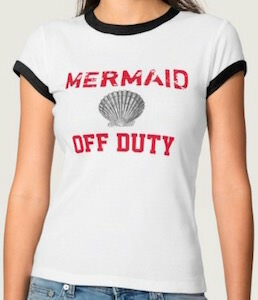 Everyone would love to see a real mermaid and if you wear this t-shirt they all can. On this t-shirt you can see a shell in the middle and around it in red letters the text “Mermaid Off Duty” and that of course means that you are really a mermaid. You can get this women’s mermaid t-shirt in many styles and colors so that it is the perfect shirt for you to show the world that you really are a mermaid only one with legs but still you can swim with those to.